C12 (2380) masking tape is designed specifically for use where high temperature cure is required. It is conformable, hugs curves, goes on quickly and easily, sticks at a touch and stays put. C12 (2380) produces an excellent finished paint line. C12 (2380) is a tan colored smooth crepe paper treated with a heat and solvent resistant saturant and a natural synthetic rubber blend adhesive. 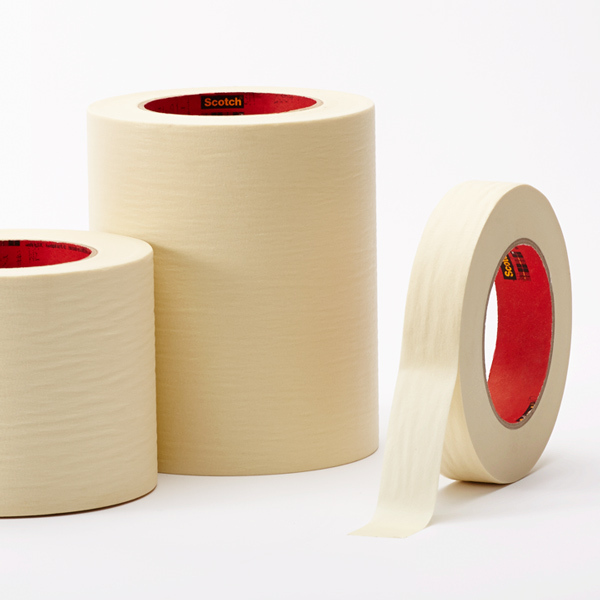 A smooth, strong, mini-crepe paper masking tape suitable for most paint masking applications. Designed for industrial use where a good paint line is desired and drying conditions range from air dry to an oven bake. Note: Should not be subjected to outdoor exposure or prolonged sunlight. Tape may become difficult to remove. 9.5mm Crepe Tape (0.375 X 60y"
12.7mm Crepe Tape (0.500 X 60"
19.0mm Crepe Tape (0.750 X 60"
25.4mm Crepe Tape (1.000 X 60"
31.8mm Crepe Tape (1.250 X 60"
38.1mm Crepe Tape (1.500 X 60"
44.5mm Crepe Tape (1.750 X 60"
50.8mm Crepe Tape (2.000 X 60"
76.2mm Crepe Tape (3.000 X 60"
152.4mm Crepe Tape (6.000 X 6"